I am a fan of actor Robin Williams. I love a lot of his films. I join the millions of people who are saddened by his death last August 11, 2014. As a way of remembering him for all the great movies he has done and the life he lived, I did a simple Peter Pan nail art in his honor. I decided to use his character in his 1991 movie, Hook. 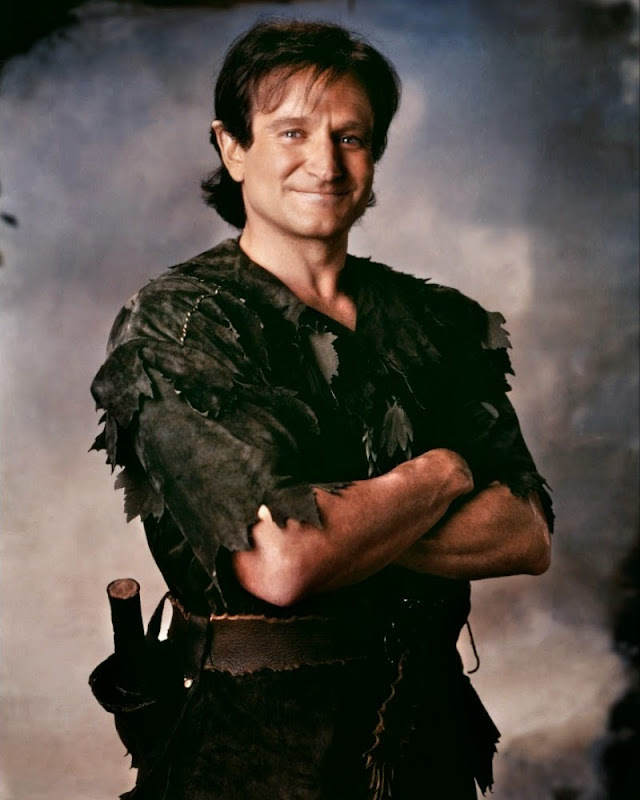 He played an adult Peter Pan in the fantasy film. It's one of my favorite movies of his, including Bicentennial Man, Dead Poets Society, Aladdin, What Dreams May Come, and Patch Adams. He truly is a remarkable actor and he will be greatly missed. 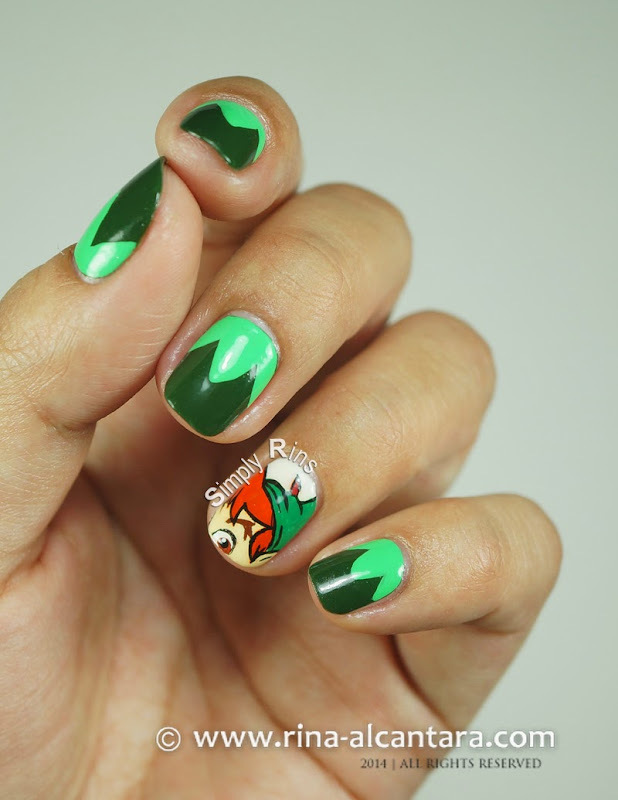 I also thought that a Peter Pan inspired nail art would be fitting for the occasion because the actor suffered from depression and green is the color of the Depression Awareness campaign. The online nail community actually requests that we post our green manicures on Sunday to help in spreading this movement. I'll probably post another one this weekend to join this project. This is a very simple freehand nail art design with an accent nail. Base is Dazzle Dry Me d' Forest Queen in 2 coats and the design was painted using acrylic paints and detailing nail art brushes. It has been quite a very long time since I've done an accent nail and painted a cartoon character. It was a bit challenging but very fulfilling in the end. 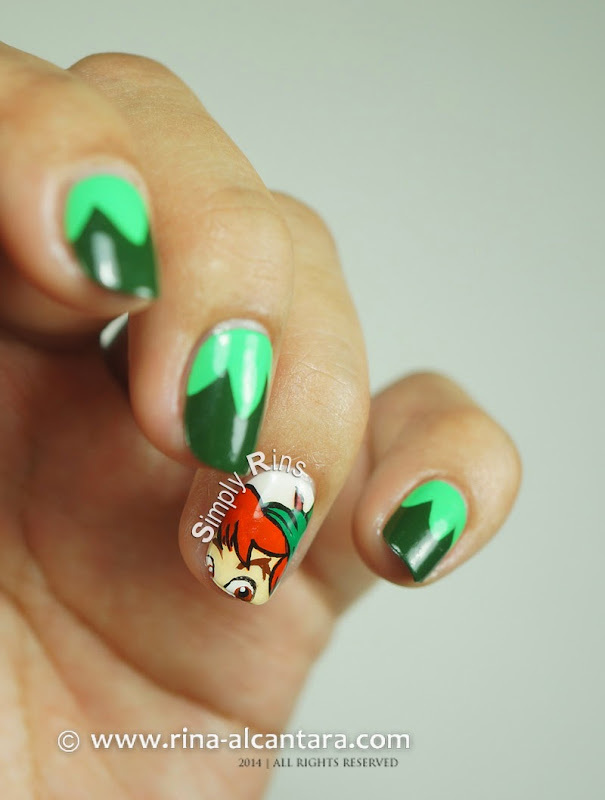 On the rest of my nails, I painted a design that would represent Peter Pan's green outfit. It's not an original. I have seen manicures like this. If you know who the original artist is, please let me know in the comment section so I can properly give credit. No accent nail on my right hand. Although now, I would have wanted to paint a green ribbon. Perhaps on Sunday. To Robin Williams, thank you for sharing part of your life to us as an actor. You remain to be an inspiration. Rest in peace. "I started doing comedy because that was the only stage that I could find. It was the pure idea of being on stage. That was the only thing that interested me, along with learning the craft and working, and just being in productions with people." wow it looks like a nail sticker. amazing nail art. i will never forget my mrs. doubtfire. Oh, I forgot to include Mrs. Doubtfire. I also love that movie!